To some in Brisbane, Racecourse Road, Ascot is known for cafes. Which is odd, since almost all of the cafes on the street are not especially remarkable. There is a Coffee Club, a Grill’d, a small Japanese place, and a few other restaurants and cafes, but none can compare to a decent cafe, let alone somewhere like Campos or Dandelion and Driftwood. Casual dining is the niche Racecourse Road fills now, with a number of nice small places that serve ordinary coffee and good food. Vagelis is one of these. Their coffee is unremarkable, but it’s good for casual dining. The menu has a very Greek theme, and it is the better for it. 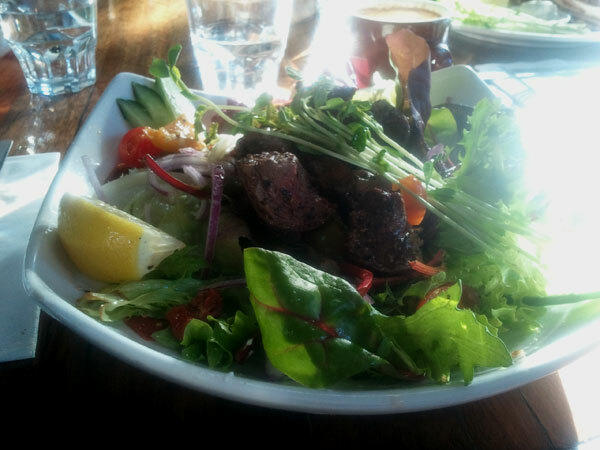 Both the keftedes and warm lamb salad certainly won’t let you down. This time, I went for the lamb salad over the keftedes. The lamb was tender, and marinated perfectly, and while they certainly filled the plate with green leafy stuff, they did not skimp on the important parts: the lamb itself, feta cheese, tomato, eggplant, olives and capsicum. The coffee itself sits a little to the right of the thick bit of the bell curve. They use Di Bella coffee and the result is decent. But still, as harsh as this sounds, if you were after remarkable coffee, you would not be on Racecourse Road. 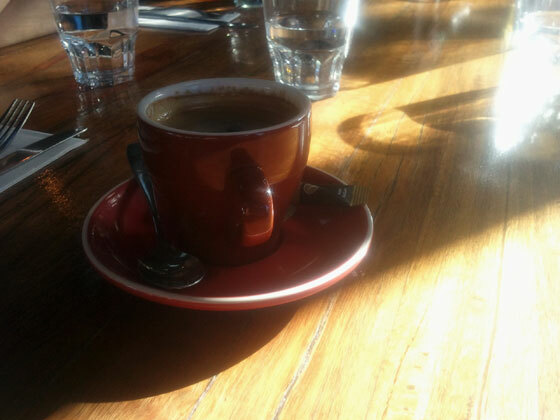 If you want excellent coffee, why are you on Racecourse Road in the first place?